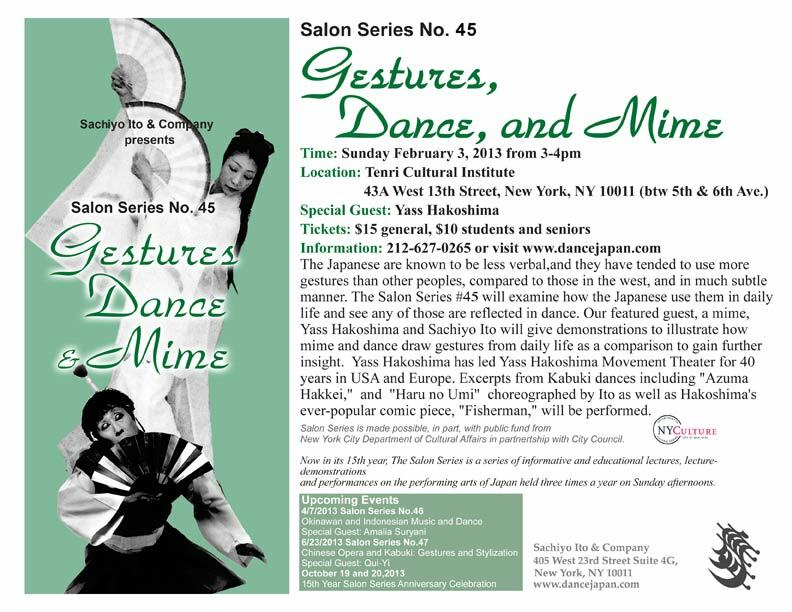 The 15th Year Anniversary Concert of the Salon Series will encompasses Japanese dance from ancient to contemporary, honoring the 15 years of community service in New York we have held to educate and inspire general public on the performing Arts of Japan. 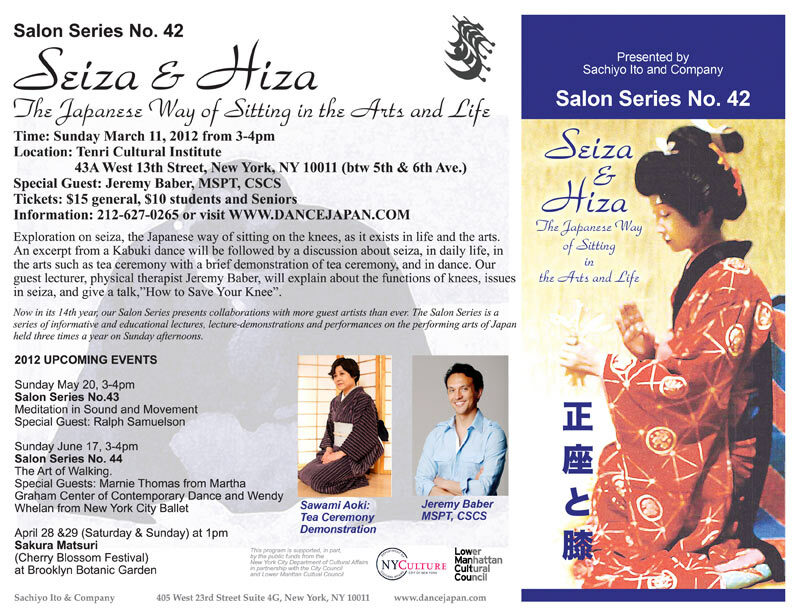 It will be held at Tenri Cultural Institute, NYCity, where we have held Salon Series for 15 years. On Sunday June 17, 3-4pm, we will hold Salon Series No. 44, titled The Art of Walking. The program will encompass various dance disciplines from Japanese classical dance and Okinawan dance to ballet and contemporary dance to exhibit the walk, the very basic of dance techniques. There will be brief dance works from each discipline as well as co-demonstration of walking techniques. The cultural and social meanings that affect the dance forms will be discussed. Our special guests are Marnie Thomas from Martha Graham Center of Contemporary Dance and Wendy Whelan from New York City Ballet. Solo from Jerome Robbin’s ” Dances at a Gathering” performed by Wendy Whelan. Solo from Martha Graham’s “Steps in the Street” performed by Marnie Thomas. Excerpt from Sachiyo Ito’s “Yanagi no Wakaba” performed by Dancejapan Ensemble and Excerpt From “Nuha-bushi” performed by Sachiyo Ito. After graduation from Sarah Lawrence College in 1958, Marnie Thomas joined the Martha Graham Dance Company, touring and performing with the Company, teaching at the Graham School, and was privileged to be part of the first generation of women to perform Ms. Graham’s own roles as Graham began choosing successors for her earlier repertory reconstructions. Currently, Ms. Thomas serves as a consultant and rehearsal coach for the Graham Company and is a faculty member of the Martha Graham School, Peridance International, and Adelphi University. Admission: $15, $10 for student & senior. 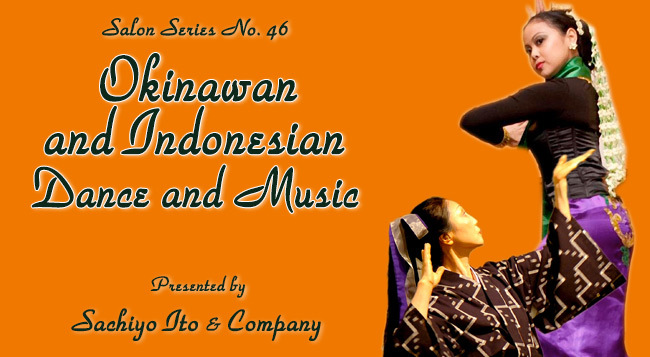 Salon Series is an ongoing series of informative and educational lectures, lecture-demonstrations and performances aimed at those who are interested in deepening their knowledge of performing arts of Japan. The series is held on Sunday afternoons three times a year. On Sunday May 20, 3-4pm, we will hold Salon Series No.43, titled Meditation in Sound and Movement. For the first time in 14 years of Salon Series, this program is presented as a workshop. Participants can choose to learn walking meditation, Shakuhachi meditation, or both. Our special guest is Ralph Samuelson, the Shakuhachi Master who has conducted meditation workshops with Shakuhachi for many years in the Zen Mountain Monastery. The Japanese bamboo flute, the shakuhachi, is associated with Zen Buddhism from 16th century Japan. Playing Honkyoku pieces is sometimes referred as Sui-zen (blowing Zen), and focuses on breath, stillness, and concentration with the mind of Za-zen (sitting Zen meditation). Breathe in, breathe out into your flute and listen to the sound. Sachiyo Ito will lead a walking meditation in the tradition of Community of Mindfulness under the teaching of Thich Nhat Hanh. As a special bonus, a dance which was created last year as a dedication to Japan’s Earthquake victims, titled, “Dedication,” will be performed at the end of the program. 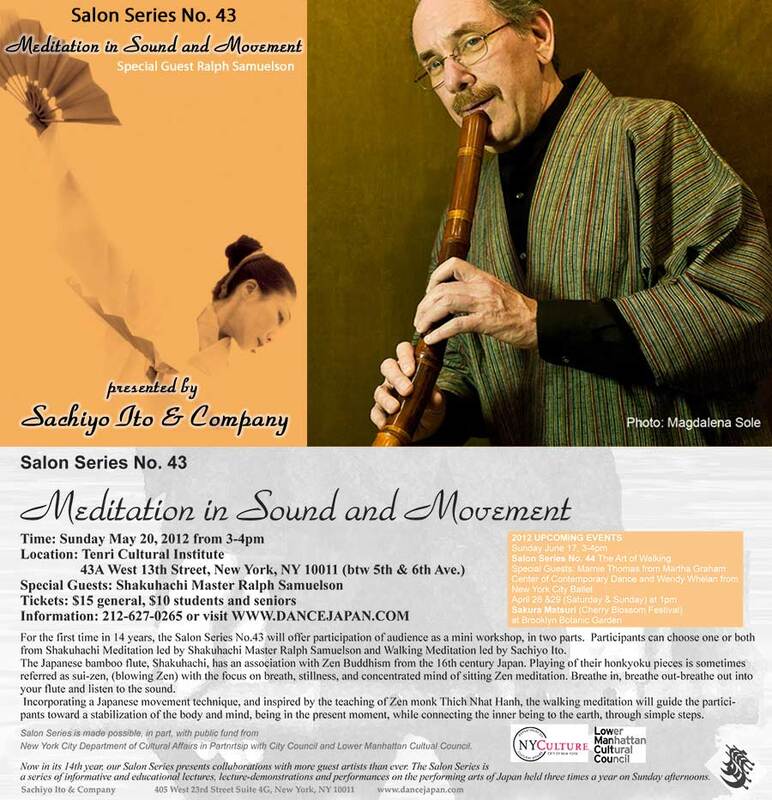 Ralph Samuelson is a performer and teacher of the Japanese bamboo flute, shakuhachi. He was trained in the classical tradition of the Kinko School under the tutelage of the late Living National Treasure Goro Yamaguchi, as well as by Shudo Yamato and Kodo Araki V. He began shakuhachi studies in 1969 as a graduate student in the World Music Program at Wesleyan University and studied traditional music in Tokyo in the 1970s under the guidance of the distinguished musicologist Fumio Koizumi. Mr. Samuelson has performed in leading concert venues in New York, around the United States, and in Europe and Asia. He has been presented in live radio and television broadcasts in the US and Japan and has recorded for Music of the World, Lyrichord Records, CBS Masterworks, Axiom, Tzadik, and other labels. 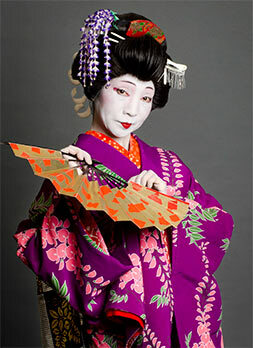 In 1991 and in 2008 he was the featured shakuhachi soloist in the New York City Ballet’s production of Jerome Robbins’ “Watermill”, with music by Teiji Ito. In spring 2011 he was an artist-in-residence at the Lou Harrison House in Joshua Tree,California; and in fall 2011 he was a guest artist at the Seoul Institute of the Arts in Korea. Since 1976 Mr. Samuelson has also worked as a foundation professional facilitating and supporting international cultural exchange, and from 1991 to 2008 he served as director of the Asian Cultural Council, a foundation supporting exchanges in the arts and humanities between the United States and Asia. Classical Japanese Dance and Okinawan Dance at 1pm at the Cherry Esplanade Main Stage at Brooklyn Botanic Garden. 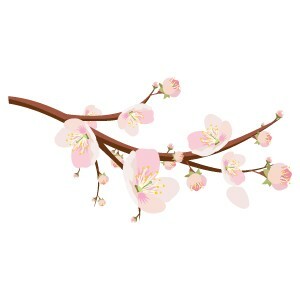 The celebration of Hanami culminates in the two-day Sakura Matsuri cherry blossom festival, the nation’s largest event in a public garden. Visitors of all ages can enjoy music, workshops, and crafts. On Sunday March 11, 2012 from 3-4pm, we will hold Salon Series No. 42, titled Seiza, the Japanese Way of Sitting in the Arts and Life. We will explore seiza, the Japanese way of sitting on the knees, as it exists in life and the arts. 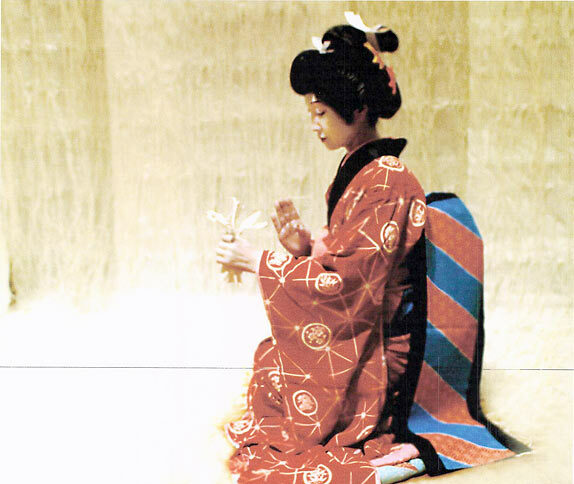 An excerpt from a typical Japanese classical dance, Kagamijishi, will be followed by a discussion about how the Japanese sit, explaining how it is used in the arts such as tea ceremony with a brief demonstration of tea ceremony, and how it is used in dance. Our guest lectuerer, physical therapist Jeremy Baber, will explain about the functions of knees and muscles and issues in Japanese-style sitting, as well as give a special talk titled,” How to Save Your Knees.” A lively Q&A session is expected. Jeremy Baber is a physical therapist, educator and chronic pain specialist. He has a strong background in dance medicine having served as the touring physical therapist for the touring productions of Twyla Tharp’s Movin’ Out and the smash hit Wicked. Jeremy has developed a cutting-edge performance enhancement system known as Primal Rekinetix™. Primal Rekinetix™ increases strength, flexibility and coordination in minutes by rebooting the brain’s motor cortex. Jeremy’s experience working with chronic pain patients, performing artists and professional athletes has taught him that a holistic approach that addresses mind, body and spirit is vital to successful outcomes. Jeremy Baber is the Clinic Manager of Bounce Back Physical Therapy in Chelsea.